​With lavish use of Ultra Violet - the PANTONE color for 2018! 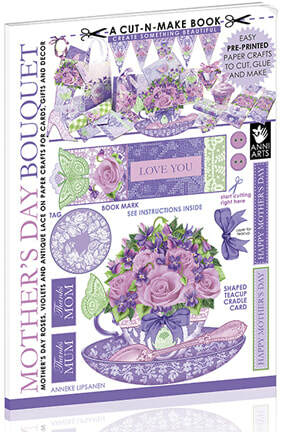 ​MOTHER'S DAY BOUQUET CUT-N-MAKE BOOK! A super quick, inexpensive, pretty and practical card and gift! Perfect containers for little sweet things. The heart basket can be filled with flowers - silk or real with stems wrapped in aluminium foil or plastic wrap. A posy in a basket hanging from a door handle is an old Mother's Day tradition. Pay securely with a CREDIT CARD or your PAYPAL ACCOUNT. You do NOT need a Paypal account to buy. This is a digital download product - nothing will be shipped. that are set up to also print on A4. ​If you have any product suggestions, messages or comments, do let me know on the home page. • You need a color printer to print the pages. Set quality to "best"
• Suggested paper: Matte photo paper like Canon 170 gm which is especially for Arts and Crafts and plain paper for the paper projects. I also like Stora Enso cardstock which has the same bright white on both sides which is great for double-sided printing.